You might be eagerly waiting for your child to take their first steps but trust us, once they do EVERYTHING changes. Here’s what you need to do to keep your little one (and the house!) safe once they’re on the move. Move valuables, breakables, things they could choke on and anything dangerous or destructive (e.g. scissors, colour pens, the dog’s bowl, medicines) out of reach. 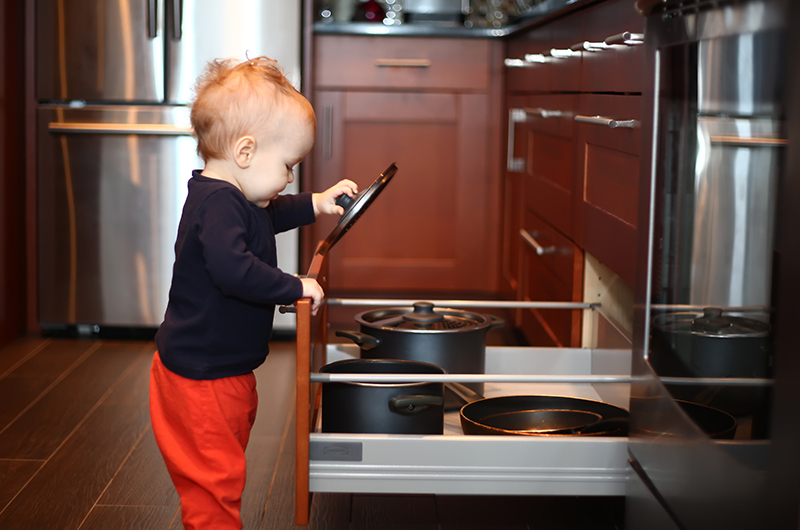 Put child-proof safety latches on cupboards, drawers, the fridge, oven and toilet seats. Remove all plants (unless you want a daily dirt party). Install baby gates for doors and stairs. Anchor book shelves, other heavy furniture and items like the TV to the wall to prevent falls. Cushion sharp table edges with corner guards. Block electrical outlets with baby-proof covers. Install cordless blinds or ensure they meet safety standards to avoid choking. Ensure all exits and entrances are secured with screen doors or unable to be opened by your child. Turn kitchen pot handles to the rear and never leave a full bath unattended. Move their cot away from any windows and light switches, make sure the mattress is on the lowest setting and remove any hanging mobiles they can now reach. A walking bub is also a wriggly one who will now not want to stop and lie down to get their nappy changed. A simple solution for this is to use a pull-on nappy instead. Popping one on when they’re upright is so much easier than the kicking and screaming protest that happens when they’re on their back with a normal nappy. Toddler leashes: Like walking a dog? Or a safety-first option? Your little one will be walking on all kinds of surfaces now so they need decent shoes that will protect and support their growing feet properly. 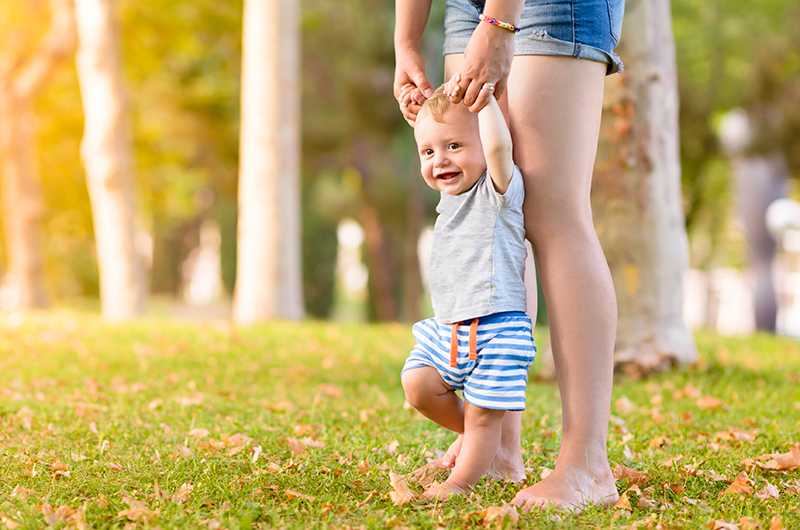 Just be careful not to get soles that are too hard or shoes that are the wrong size, as this could actually slow down your child’s walking progress and damage their feet long-term. One minute they’re walking, the next they’re running. 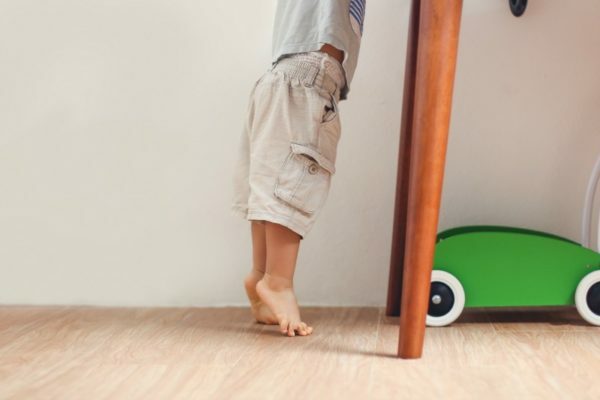 In the blink of an eye, your tiny tot can be getting up to all kinds of mischief so you’ll need to get your tabs on their whereabouts at ALL times, even if they’re not that fast yet. And be sure to hold their hand firmly when outside or in shopping centres, especially if you have a bolter! They don’t call it toddling for nothing! Now that they can walk (usually REALLY slowly in the early days), they’ll want to do a lot more things by themselves which can mean that doing chores, going shopping or for short walks can now take ages! And get ready for falls too as they’re pretty unsteady at first and have no spacial awareness, so pack lots of band-aids if you’re heading out somewhere. A bumbling toddler with a huge proud smile is the absolute cutest, so make sure you snap away to get some photos and videos so you can always remember this adorable (although challenging!) phase. We promise one day you will look back on this time fondly, but until then you’d better brace yourself!